Back in 1994, the Chorus had 23 singers at the first concert of Bach’s Christmas Oratorio. Now our membership numbers about 60 and we have gone on to give a regular programme of major concerts in Newham and further afield. Since that first concert the choir & orchestra have performed a wide range of works which include all the major works of Bach and most of the major works by composers such as Mozart, Handel, Brahms, Verdi, Haydn, Mendelssohn, Schubert and so on. With our growing reputation, the audiences have grown as well. At one notable performance of Handel’s Messiah in Stratford there was standing room only with an audience of over 450 people. As Chorus funds have become more secure the concerts have become more frequent with up to five concerts with orchestra each year. The chorus receive no funding from any local or national government departments. We are a registered charity, and all of our income is generated through member subscriptions, donations, fundraising events such as quiz nights, sponsored cycle rides, barbeques, curry nights and sponsored events by individual members. All this ensures that the ticket prices remain affordable – everyone gets a bargain. 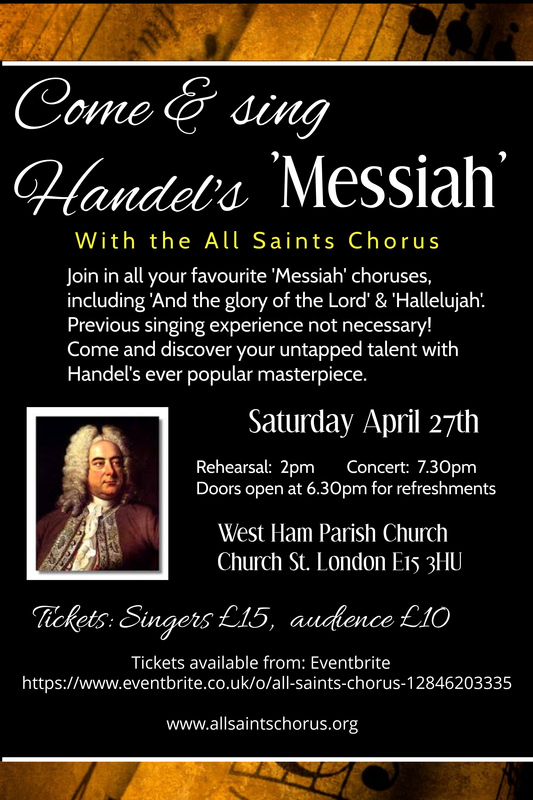 We are also supported in a practical way by West Ham Church, who offer us rehearsal space and our main venue for performance. The Chorus is very grateful for that partnership and, in return, enjoys supporting the church at some of its big festival services. The orchestra continue to amaze our audiences with their musicianship – this should not be surprising as many players are drawn form the leading London orchestras. Likewise our superb team of soloists who themselves have played a major role in developing music in Newham and have lifted and inspired many a concert.